HAYS Cleaning celebrates bringing free housecleaning services to area veterans, active military and their families for 7 years! The program was launched by the owners of HAYS Cleaning, Mary and Art James, in 2010, as a way to honor local men and women who have served in the United States Military. 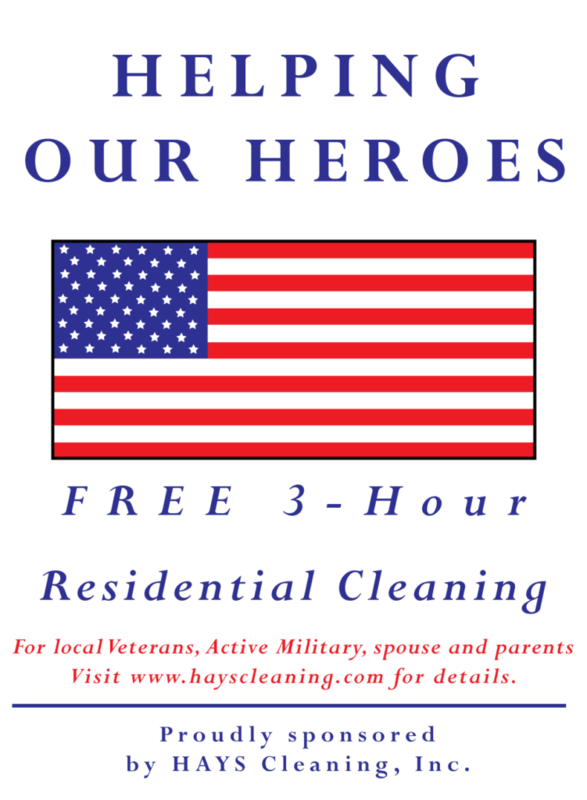 Continuing the tradition, HAYS Cleaning will provide 3 free hours of cleaning services to local military veterans as well as to those in active service. Call 708-598-3819 or email mary@hayscleaning.com to schedule your appointment for services. This entry was posted in Discounts, HAYS Family, Helping Our Heroes, News, Promotions, Veterans and tagged Chicagoland housecleaning, cleaning service, cleaning service Palos Hills, HAYS Cleaning, Hickory Hills house cleaning, HIckory Hills housecleaning, housecleaning, residential cleaning, Veterans, Veterans Free Cleaning by HAYS Cleaning. Bookmark the permalink.